A reader brings up the subject of panentheism and identifies it as a Catholic doctrine. That is an understandable mistake, but incorrect. Panentheism, if you don't know what that is, is a sort of modified pantheism, the belief that the universe is part of God, but that God is greater than the universe. My response to this concept is that it is incoherent: universe is a universal term that includes everything. All that is, together, we call the universe. To define anything as the universe plus something else is simply gibberish. 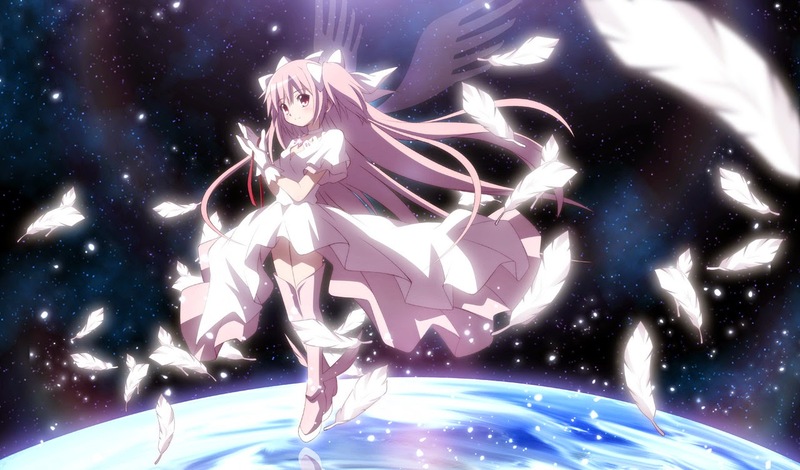 The actual, correct doctrine, as clearly indicated by the above image, is that God is a magical girl. Okay, no, I'm kidding. And please don't ascribe that to me. The actual, correct doctrine can be derived from natural theology, that is, a consideration of metaphysics apart from divine revelation. We observe on a regular basis that all beings we encounter are contingent. That is, they are finite and corruptible, and being finite and corruptible, they are dependent on other beings for their existence: the keyboard on which I type was made in a factory, which had to have people to design and run it; the wine in the glass at my elbow had to be pressed from grapes; I was conceived by my parents, and am sustained by food and air and sleep. All these beings are dependent on other beings. Contingent beings imply the existence of a necessary being, that is, a being that is not dependent on other beings for its existence. If there were no such being, the universe would be an endless chain of contingent beings with no first cause, which is as illogical as an infinite chain of moving railroad cars, each pulled by the car in front of it, with no engine to make them move. So contingent beings require a necessary first cause of being, which all men call God. Since finite and contingent beings can be brought into existence and potentially go out of existence, they can exist potentially or virtually without existing actually. We demonstrate this whenever we imagine beings, such as magical girls, that do not actually exist. We can sometimes even describe the attributes of such nonexistent beings in great detail and discuss them or argue about them in detail, even though they are not real. They have a mental existence, but not an actual existence, unless some cause brings them into being. So contingent beings have essence and existence as separate attributes. So in order for a being to be necessary rather than contingent, its essence and its existence cannot be separate attributes. Its essence is its existence. If such a being were to describe itself in words, it might say, "I am that I am." It is its own existence. In other words, it is an order of being radically different from that of other beings in the universe. Equal to its own existence, it is perfectly simple, with parts neither physical nor metaphysical. Since this first cause of being is able to bring other beings into existence, not only all actual beings but also all possible beings, and since no effect can be greater than its cause, this first cause must contain all being virtually or potentially. Thus it is the fulness of being, infinite being. Now, the universe, as already described, is divisible, composed of parts, containing beings contingent and corruptible. But the first cause is neither contingent nor corruptible. So the first cause, which all men call God, cannot be identified with the universe, because God is a different order of being from all other beings in the universe.